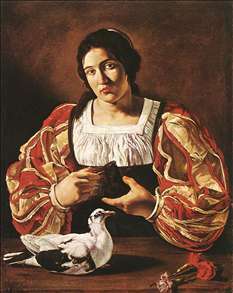 Mancini, in his Considerazioni sulla Pittura of c. 1620, mentions a Francesco detto del Caravaggio as an admirer and imitator of Caravaggio. 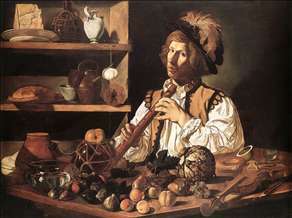 In a document of 1619 a Cecco - an abbreviation of Francesco - is recorded among French artists working with Tassi at Bagnaia in 1613-15. he is therefore believed to be French (or at least Northern), which is supported by his hard, coarsely realistic style, with exaggerated facial expressions and elaborate still-life attributes. His works are datable c. 1610. More recently, Cecco has been identified as the Lombard Francesco Buoneri, who may originally have come from Bergamo, whose crisply painted Resurrection of Christ (Art Institute of Chicago) was commissioned in 1619-20 though later rejected by Piero Guicciardini, the ambassador to the Medici court in Rome, for his family chapel in Santa Felicit in Florence. See more details about "The Flute Player"
See more details about "Woman with a Dove"